At 20:18 Swissair flight SR 111, departed New York-JFK Airport on a flight to Geneva, Switzerland. Forty minutes later the copilot contacted Moncton ACC, reporting FL330. At 21:10 the pilots detected an unusual odour in the cockpit and began to investigate. They determined that some smoke was present in the cockpit, but not in the passenger cabin. They assessed that the odour and smoke were related to the air conditioning system. Four minutes later a Pan Pan radio call was made to Moncton ACC. The aircraft was about 66 nm southwest of Halifax. The pilots reported that there was smoke in the cockpit and requested an immediate return to a convenient place. The pilots named Boston, which was about 300 nm behind them. The Moncton ACC controller immediately cleared SR 111 to turn right toward Boston and to descend to FL310. Then the controller asked SR 111 whether they preferred to go to Halifax. The pilots expressed a preference for Halifax. They immediately received an ATS clearance to fly directly to Halifax. At this time, the pilots donned their oxygen masks. At 21:16, the controller cleared SR 111 to descend to 10000 feet. Two minutes later they were cleared down to 3000 feet. At 21:19, the controller instructed SR 111 to turn left to a heading of 030 for a landing on runway 06 at the Halifax, and advised that the aircraft was 30 nm from the runway threshold. The aircraft was descending through approximately FL210 and the pilots indicated that they needed more than 30 nm. The controller instructed SR 111 to turn to a heading of 360 to provide more track distance for the aircraft to lose altitude. The flight crew discussed internally the dumping of fuel based on the aircraft's gross weight, and on their perception of the cues regarding the aircraft condition, and agreed to dump fuel. The flight was vectored to the south to dump fuel. At 21:24, both pilots almost simultaneously declared an emergency. The co-pilot indicated to the controller that they were starting to dump fuel and that they had to land immediately. Last radio contact was one minute later when they again declared an emergency. By now the fire had propagated, causing severe disturbances of the electric system. In the last minutes of the flight, the electronic navigation equipment and communications radios stopped operating. The aircraft descended over the dark waters off the coast of Nova Scotia until it stuck the water in a 20 degrees nose down and 110 degrees right bank. 1. Aircraft certification standards for material flammability were inadequate in that they allowed the use of materials that could be ignited and sustain or propagate fire. Consequently, flammable material propagated a fire that started above the ceiling on the right side of the cockpit near the cockpit rear wall. The fire spread and intensified rapidly to the extent that it degraded aircraft systems and the cockpit environment, and ultimately led to the loss of control of the aircraft. 2. Metallized polyethylene terephthalate (MPET)-type cover material on the thermal acoustic insulation blankets used in the aircraft was flammable. The cover material was most likely the first material to ignite, and constituted the largest portion of the combustible materials that contributed to the propagation and intensity of the fire. 3. Once ignited, other types of thermal acoustic insulation cover materials exhibit flame propagation characteristics similar to MPET-covered insulation blankets and do not meet the proposed revised flammability test criteria. Metallized polyvinyl fluoride–type cover material was installed in HB-IWF and was involved in the in-flight fire. 4. Silicone elastomeric end caps, hook-and-loop fasteners, foams, adhesives, and thermal acoustic insulation splicing tapes contributed to the propagation and intensity of the fire. 5. The type of circuit breakers (CB) used in the aircraft were similar to those in general aircraft use, and were not capable of protecting against all types of wire arcing events. The fire most likely started from a wire arcing event. 6. A segment of in-flight entertainment network (IFEN) power supply unit cable (1-3791) exhibited a region of resolidified copper on one wire that was caused by an arcing event. This resolidified copper was determined to be located near manufacturing station 383, in the area where the fire most likely originated. This arc was likely associated with the fire initiation event; however, it could not be determined whether this arced wire was the lead event. 7. There were no built-in smoke and fire detection and suppression devices in the area where the fire started and propagated, nor were they required by regulation. The lack of such devices delayed the identification of the existence of the fire, and allowed the fire to propagate unchecked until it became uncontrollable. 8. There was a reliance on sight and smell to detect and differentiate between odour or smoke from different potential sources. This reliance resulted in the misidentification of the initial odour and smoke as originating from an air conditioning source. 9. 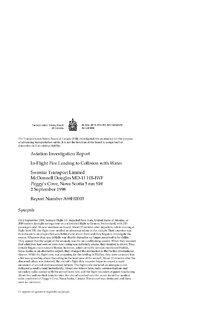 There was no integrated in-flight firefighting plan in place for the accident aircraft, nor was such a plan required by regulation. Therefore, the aircraft crew did not have procedures or training directing them to aggressively attempt to locate and eliminate the source of the smoke, and to expedite their preparations for a possible emergency landing. In the absence of such a firefighting plan, they concentrated on preparing the aircraft for the diversion and landing. 10. There is no requirement that a fire-induced failure be considered when completing the system safety analysis required for certification. The fire-related failure of silicone elastomeric end caps installed on air conditioning ducts resulted in the addition of a continuous supply of conditioned air that contributed to the propagation and intensity of the fire. 11. The loss of primary flight displays and lack of outside visual references forced the pilots to be reliant on the standby instruments for at least some portion of the last minutes of the flight. In the deteriorating cockpit environment, the positioning and small size of these instruments would have made it difficult for the pilots to transition to their use, and to continue to maintain the proper spatial orientation of the aircraft. This amendment adopts a new airworthiness directive (AD), applicable to all McDonnell Douglas Model MD-11 series airplanes. This action prohibits installation of a certain In-flight Entertainment Network system. This amendment is prompted by the results of a special certification review of the in-flight entertainment system installed on a Model MD 11 series airplane that was involved in a recent accident. The actions specified in this AD are intended to prevent possible confusion as the flightcrew performs their duties in response to a smoke/fumes emergency, which could impair their ability to correctly identify the source of the smoke/fumes and subsequently affect the continued safe flight and landing of the airplane. This amendment adopts a new airworthiness directive (AD), applicable to certain McDonnell Douglas Model DC-10-10F, DC-10-15, DC-10-30, DC-10-30F, and DC-10-40 series airplanes, and Model MD-11 and -11F series airplanes, that requires a determination be made of whether, and at what locations, metallized polyethyleneteraphthalate (MPET) insulation blankets are installed, and replacement of MPET insulation blankets with new insulation blankets. This amendment is prompted by reports of in-flight and ground fires on certain airplanes manufactured with insulation blankets covered with MPET, which may contribute to the spread of a fire when ignition occurs from small ignition sources such as electrical arcing or sparking. The actions specified by this AD are intended to ensure that insulation blankets constructed of MPET are removed from the fuselage. Such insulation blankets could propagate a small fire that is the result of an otherwise harmless electrical arc and could lead to a much larger fire. Distance from New York-John F. Kennedy International Airport, NY to Genève-Cointrin Airport as the crow flies is 6159 km (3849 miles).